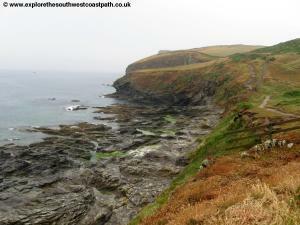 This walk shows the huge variety of scenery along the coast path. 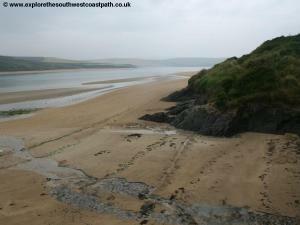 From Rock the walk head north through extensive sand dunes beside the Camel estuary to the popular beach of Polzeath. Continuing east the walk rounds Pentire Point, rather like moorland beside the sea with it's rock outcrops and roaming sheep. 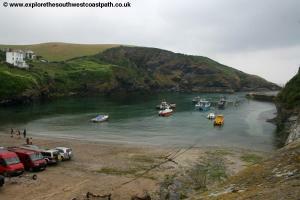 Continuing east the walk passes the remote harbour at Port Quinn and round the coast to Port Isaac, a beautiful little port crammed into a steep valley and used as the location for many TV series. Rock is reached from the A39 at Wadebridge. The A39 is the main road through North Cornwall and North Devon. East of Wadebridge at the roundabout junction with the A389 and B3314 take the B3314. Follow this road for around 3 miles and then turn left when signed for Pityme, Splatt and Rock. Rock is around 2 miles along this road. Follow the road all the way through Rock, there is a car park (pay and display) at the end of the road, in an old quarry where there are also toilets. If you are coming by public transport Rock is served by Western Greyhound service 584 that runs between Camelford and Wadebridge via Port Isaac, Polzeath and Rock. The bus runs around once every two hours Monday - Saturday and 4 times on Sundays. For details see the links below. In addition there is a passenger ferry to Rock from Padstow, which has more frequent public transport links. This operates very regularly all year round (for pedestrians only). Normally it operates from Padstow Harbour, but when the tide is low and the harbour empties it operates from the beach just over a 5 minute walk north of the harbour. Rock has limited holiday accommodation. Rock Holidays have a number of self-catering properties in and around the area to let. The St Enodoc Hotel is in Rock and offers good views. There are also a couple of camping and caravan parks nearby. 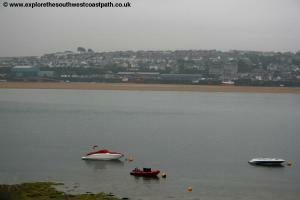 There is a far wider choice of accommodation across the Camel estuary in Padstow. For details, see the links below or call 01841 533449. Rock is a small village on the eastern banks of the Camel estuary. 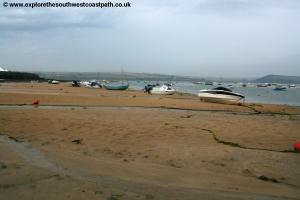 To the south of the village is Porthilly Cove a pleasant beach with a church on the south western corner. 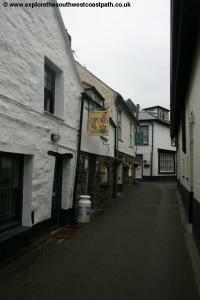 The village is also a sailing centre with the calm waters of the Camel estuary proving popular. The walk begins from the end of Rock Road, the main road through the village. Note that if you arrive by bus the bus drops you at the top of this road, around half a mile from the coast. On reaching the camel estuary turn right, keeping the river on your left. Pass the sailing club on the right and keep going along the road until you arrive at the car park. This used to be a quarry but has since been converted to a car park and you will find public toilets here as well. 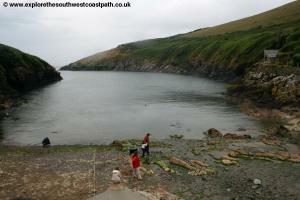 The coast path begins and is signed from the corner of the car park, beside the toilets. Heading north away from the car park you take the wide sandy path closest to the coast in the back of the dunes. The Camel estuary is unusual in that sandy beaches exist quite far along the estuary and this is no exception as you have a fine sandy beach on the left backed by the huge dune system you are walking on and to the right is St Enodoc Golf course. 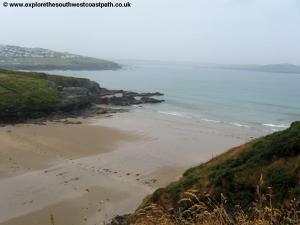 Ahead you come to a little sandy bay and take the path leading back through the dunes on the other side offering fine views over to St Saviours Point and the war memorial on the opposite bank and Padstow a little further up the estuary. Now keep on the wide path close to the front of the dunes until you again descend down to the beach with Brea House close by on the right. Ahead the path rounds a steep almost circular hill, Brea Hill where there are low cliffs and then you round the corner to Daymer Bay. 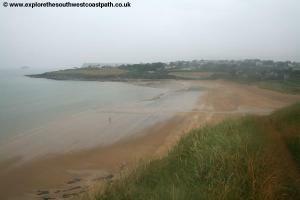 This is an excellent beach with it's wide sandy beach in the mouth of the estuary providing a sheltered beach. This means the unlike beaches further north it is poor for surfing but offers safer bathing and a more peaceful location. Just inland of Daymer Bay is the fascinating church of St Enodoc. The church is situated in the sand dunes, although to the east is now a golf course. The main fabric of the church dates from the 12th Century, but it's location in these shifting dunes meant that from the 16th Century through to 1864 the church was almost totally buried in the sand and virtually unusable, the only services requiring the vicar to climb in through a whole in the roof. The church was finally restored in 1864-65 with the sand removed as it remains today. 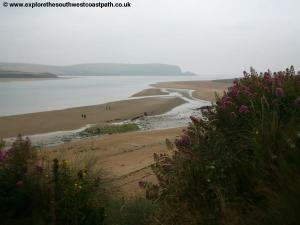 At Daymer Bay there are two possible routes. At high tide you may have to follow a path along the back of the beach and through the dunes, but at most states of the tide the preferred route is across the beach, with the harder sand nearer the tide line proving the easiest to walk on. At the north end of the beach rejoin the coast path as it passes in front of the car park and out onto Trebetherick Point. Around here is low-density housing that makes up the village of Trebetherick. 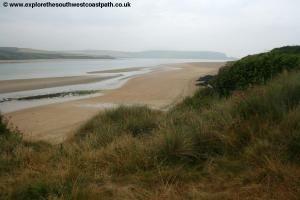 The headland offers fine views over the Camel Estuary and it's mouth. The path now continues on top of the low rocky cliffs with the sand dunes now giving way to low rock. As you round the corner from Trebetherick Point you pass behind the back gardens of some of the houses. A path to the left soon leads down to Greenaway Beach, a rocky beach but with some sand at the back of the beach. Keep north along the coast path. Ahead you have the little headland of Shag Rock where the main coast path goes straight on but another path to the left goes around the edge of the coast if you prefer, rather than cutting the corner. Beyond you come to another beach, Broadagogue Cove, but at high tide it is totally covered. There isn't a path down to this beach so you'd instead have to walk round on the rocks from Greenaway Beach so access is not recommended. As you continue you now have the first of the houses of Polzeath off to the right with a few areas of sand between the rocks to the left. Soon the path goes on a surfaced path around the edge of a large camping and caravan site to the right which also includes a car park. Rounding the edge of this camp and caravan site the path goes between some buildings and then joins the road through to Polzeath. Sadly this top part of the beach is also used as the beach car park so is usually covered with cars, but there is access to the beach here. 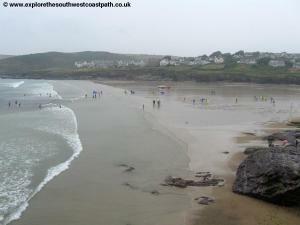 Polzeath has a fine sandy beach (also known as Hayle Bay) with some soft sand at high tide and a much wider beach at low tide. The west facing position, now clear of Stepper Point at the western edge of the Camel Estuary means this beach faces directly west into the Atlantic and this means the surf is often excellent making this a popular beach with surfers. You keep to the road through the village, which also has toilets off to the right of the road. You pass a little stream flowing onto the beach and then take the access road left into a car park. Keep to the land side of this car park and then follow the minor road leading from it's north end. 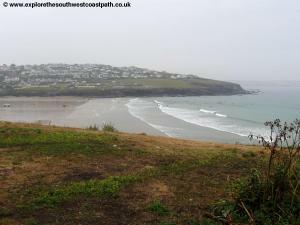 This leads up to a caravan park but a short distance after leaving the coast you follow the signed path left along the low cliffs to the north of the beach and behind the buildings of New Polzeath, which as the name suggests is a more modern part of the town. The coast path is an obvious and well surfaced path along the cliff top that soon comes out onto a road, Atlantic Terrace which you briefly follow until, after passing a couple of houses to the right, you can re-join a path along the cliff top. Follow this round to re-join the road at the north end, on Slipper Point with a house on the cliff top to the left. 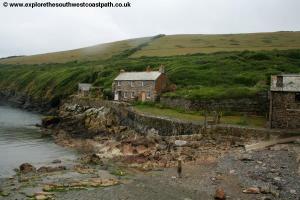 Just after this house fork left on the path that now descends to a lovely little cove, Pentireglaze Haven. This is a narrow beach with rocks on both sides and at high tide separated from the main beach at Polzeath, although at low tide it is possible to walk along the beach to this bay. You can take the track to the left to descend down to the beach, but the coast path continues straight ahead, crossing this track and now climbing back away from the beach. Ahead now we are coming to the rocky headland of Pentire Point. 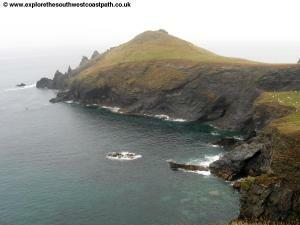 Like much of the coast around this area it is now owned and cared for by the National Trust. The nature of the coast now changes quite dramatically. Gone are the wide sandy beaches backed by dunes we have along the Camel Estuary, to be replaced by high cliffs and rocky coves. The path climbs and rounds a headland ahead and then descends into a small but quite deep valley, climbing back up again the other side. 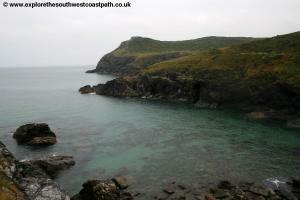 You now follow the obvious path right along the cliff edge of this very rocky part of the coast. 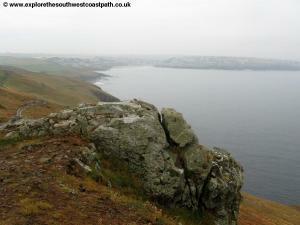 Pentire point is a delight, like a bit of moorland alongside the coast, with many rocky outcrops around the path. 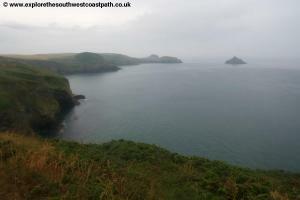 Soon you reach the western point of the headland with fine views over the Camel estuary and the coast to the south. Ahead you can see the northern point of the headland, called the Rumps, where there is an iron-age hill fort and some very unusual looking rocks. 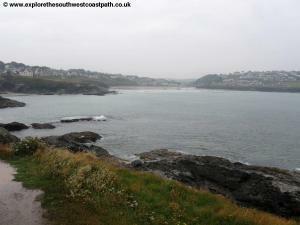 Continue along the north edge of this headland as the path then follows along the coastal side of some fields. with a wall to your right. To the left are some spectacular rocks the sort of thing that you would expect to see on Dartmoor. 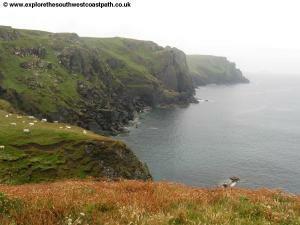 There are often sheep grazing along the cliffs tops here, too. Keep going until you come to the Rumps themselves. The hills to the left are the edge of the ancient hill fort. The coast path actually doesn't go to the end (Rumps Point), but there is an obvious path tout to Rumps Point which is well worth taking if you can spare the time. 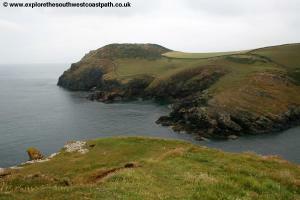 Instead the coast path misses of this headland and turns south. The path ahead keeps to the path along the edge of the fields passing the little beach on the left, sandy at low tide and a little rocky island (The Mouls) off Rumps Point to the left. Keep to the field edge path ahead past another rocky outcrops to the left. 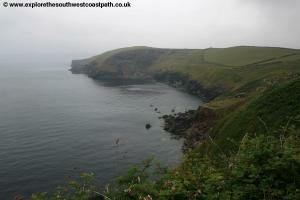 The coast path is obvious ahead and now runs right on the top of the cliffs with fine views of the coast to the east. You round Com Head offering fine views and at the rocky Pengirt Cove follow the coast as you now turn left to head east rather than SE. The obvious path ahead you follow goes through gorse and bracken with fields close by on the right. Soon you come to the spectacular rocky Downhedge Cove. The path follows the cliff tops east from here coming soon to Lundy Beach, a sandy beach except at high tide, when it is covered. 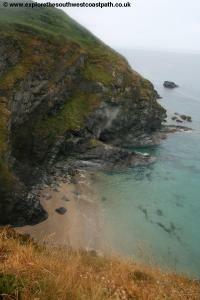 On the left soon you pass Lundy Hole, where a cave has collapsed leaving a hole in the cliff top. The path descends to the eastern edge of this beach from where you can access the beach if you want. 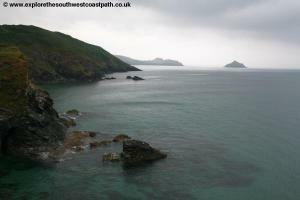 The path ahead climbs onto Pennywilgie Point and then rounds to another smaller beach, Epphaven Cove with rocks at the back and some sand at low tide. This is one of my favorite parts of coastal walking, discovering these beautiful and remote little bays that lay virtually unused when the nearby resort beaches can be packed. 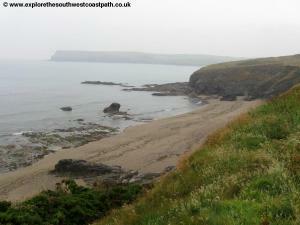 Beyond this beach the coast path climbs back on the cliff tops to reach Trevan Point. and beyond this again follows the field wall to the right. You soon come to another little beach with some sand at low tide, Gilson's Cove, although it is not accessible. Ahead you come to another headland, Doyden Point and on the top of it is Doyden Castle. This is now a holiday cottage owned by the National Trust. 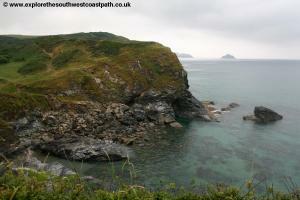 The coast path does not go out to the castle, but you can follow the minor road to it, if you wish. Continuing ahead the coast path now comes into the very narrow harbour entrant of Portquin. 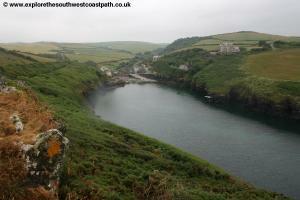 The coast path then follows the top of this harbour soon joining the road into Portquin. 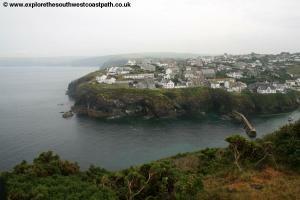 This is a small hamlet largely built by fishing and the majority of the buildings here are owned by the National Trust. The beach here is mostly rocky, with a small amount of sand and the pretty cottages above the low cliffs beside the beach. You briefly follow the road around the back of the harbour and then take the path up steps to the right just beside one of the larger houses. 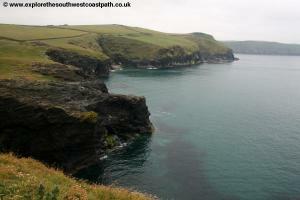 You soon climb onto the cliff top and continue once more along the coast path. The path ahead onto Kellan Head has a wooden fence all along it, stretching for several miles. I'm not quite sure why this is given the previous section of the path has managed quite well without a fence, but it does make the path particularly easy to follow. Follow this path alongside the fence as you round Kellan Head. 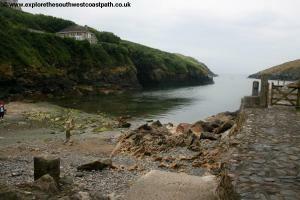 The coast path soon twists and turns a bit as you come to Downgate Cove another rocky beach. Keep to the path along the cliff top to the eastern edge of the beach where the path and coast now turns left onto Scarnor Point. Rounding this you keep to the path around the back of Greengarden Cove. The path again cuts off Carley Head. There is a path along the edge of this head if you prefer although it's legal status is not clear. 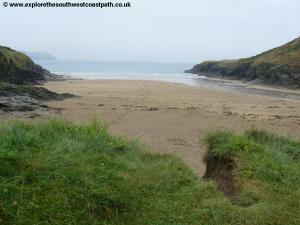 Keep ahead on the coast path with another little beach at the eastern side, Varley Sand. 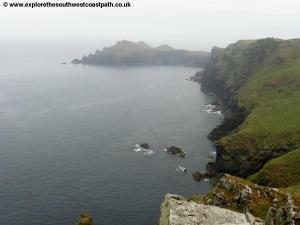 The coast path is now very easy to follow round to another steep-sided valley, Pine Haven which you follow. 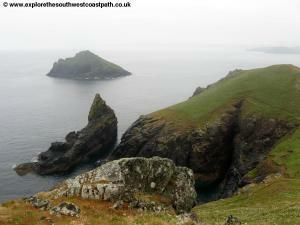 The path climbs back up on the opposite side offering fine views back to Varley Head. As you round the corner of Lobber Point you have your destination in sight, beautiful Port Isaac, soon passing the harbour wall below you. 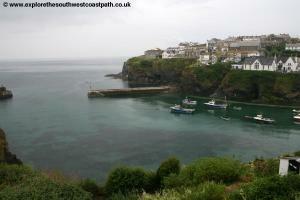 This little fishing village is really crammed into this tiny harbour and along the cliff tops and is very pretty. 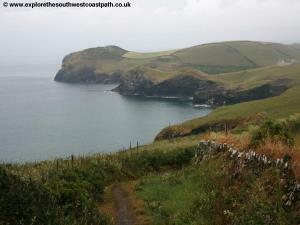 Soon you join the narrow road of Roscarrock Hill which you then follow to descend down to the beach at Port Isaac, where the walk ends. Port Isaac is a particularly beautiful little village with the sand and rocky beach (like at Polzeath though, it doubles as the beach car park so is usually covered with cars). This pretty village has been used to film a number of TV programs so may seem familiar even if you have never been here before. 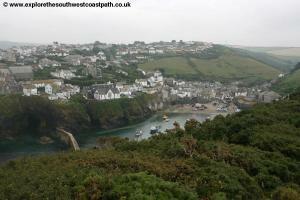 Viewers of the ITV series Doc Martin will know Port Isaac as the fictional Portwenn. If you walk up the road on the other side of the beach you can really see how narrow the roads are as cars squeeze between the buildings on this narrow and hilly road. Port Isaac has a bus service, but not surprisingly, it does not venture down to the beach due to the narrow and steep roads. Western Greyhound service 584 servers Port Isaac but it goes from outside the garage on New Road, at the top of the village on the eastern side of the harbour. The bus runs back to Rock and at the time of writing goes around once every two hours and note that in Rock it does not go right to the coast but stops around half a mile inland - ask the driver to ask you where to get off. The buses run 7 days a week in summer and Monday - Saturday in the winter. For details, please see the link below. Ordnance Survey Explorer map 106 covers this area of the coast path and is available from most book shops nationwide and many local shops including in Padstow. 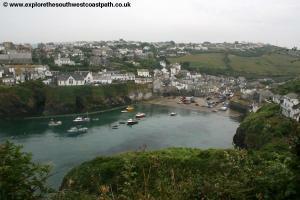 Streetmap is a web site which provides maps of the UK, including the area between Rock and Port Isaac. 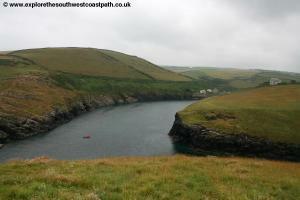 The links below cover the coast between Rock and Port Isaac.